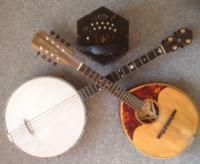 Wheatstone Anglo , 7 Mount / Chambers Anglo , mandolin , trad English , trad Irish . Thanks a million for posting these ! Im really enjoying this music , best of all I’m only half way through the list . so good to hear older versions of these wonderful tunes! I would add; if you decide to go down the surgery route, do your research and go to the team that are most recommend in your area. im sure it’s a different deal but thought I would share: I am currently engaged in treatment for Dupuytren’s contraction on my left hand , which has pulled my pinky and ring finger in by around 30 degrees it has slowed me down, but on the plus side it’s given me a good excuse to work out tunes on the right ! That’s amazingly good information! Thanks to all . the instrument will get a tune up and some pads , should be good for a few years yet ! Thanks for your help everyone, anyone have any idea of the approximate date of the serial number ?